The Foothills at Burke Mountain in Coquitlam, a 400-acre master-planned community by Wesbild, has attracted award-winning Polygon, one of B.C.’s premier home builders, with a new housing development that is already winning rave reviews. Perched on a sundrenched hillside with trees to the east and endless views of Mount Baker to the south you’ll find Tyneridge by Polygon – a family-friendly townhome community set within The Foothills neighbourhood of Coquitlam’s Burke Mountain. This is a place where nature inspires and opportunities excite. Parks and trails for family outings, clear air to breathe and room for kids to grow. For young minds, brand new schools are on the horizon and planned for just across the street. Inside, spacious three and four bedroom homes have been designed with young families in mind. Outside, private yards and patios offer places of quiet reflection or refreshing activity, while the kids burn off youthful energy in one of the many local parks. Just a short drive from Coquitlam Town Centre, Tyneridge is also within close proximity to the future community centre and shops at The Foothills planned village centre. Tyneridge is a special address offering what you need today… and all you plan for bright tomorrows. With an opening promotion offering home ownership from just $999 a month, Tyneridge offers a rare opportunity to get into a new home in a promising new community at a price you can live with. Prices from $389,900. Tyneridge opens for sale Saturday January 29th at Noon. 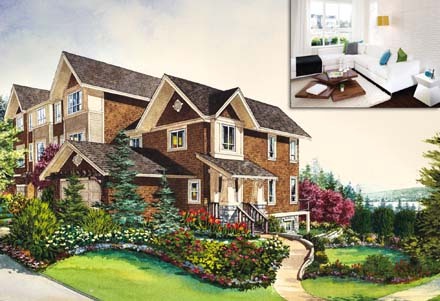 For information call 604-871-4123 or email tyneridge @polyhomes.com. Creative modular housing – hoist modules onto rooftops, float them on water – proposed for Vancouver. In an ongoing struggle with Vancouver homelessness and a lack of affordability, advocates such as city councillor Kerry Jang turn toward temporary modular housing as a possible solution. Standing in front of city hall, Coun. Kerry Jang has a commanding view of a growing city. It’s a landscape that may soon change if Vision Vancouver’s proposal to build affordable modular housing units to alleviate homelessness gains traction. Jang’s interest in bringing modular housing to public attention started when he attended a design show hosted by Architects for Humanity in May 2009. Designs at the Living Density Exhibition at the Grace Gallery on Main Street in Vancouver ranged from the practical to the provocative, showing cantilevered housing built high across city streets or housing pods attached to the exterior walls of buildings. Others illustrated how modular units could be hoisted onto rooftops or even prefabricated buildings floating on water. An example of successful modular development is Container City, devised by the Urban Space Management team in London, England, which includes office space, retail, artist studios and homes. Closer to home is Seattle’s Inhabit project by HyBrid Seattle and Mithun. Prototype modular housing units that were on public display two years ago have been sold to the non-profit Bainbridge Island Housing Trust as relocatable/affordable housing. The endless design possibilities intrigued Jang, Vision’s point person on homelessness in the city, enough to float the idea through city council last year. Interest in the design community was immediate. Ideas have been tossed back and forth for months. In a few weeks time, city staff will announce an official call for letters of interest from developers. “One thing we need to explain is that while this modular project is designed to address homelessness, the modular housing units we are calling for won’t be for the homeless,” said Jang. The new modular units would move the working poor out of single room occupancy (SRO) hotels, which could then free up the units for the homeless. The new modular units could be for singles, artists, small families or couples, and perhaps some homeless people if any non-profit groups currently working with the homeless in the Downtown Eastside want to participate. When the concept of modular housing was first floated, the immediate debate centred on quick and easy solutions, such as re-using shipping containers or adapting workcamp bunkhouses, Jang said. Architect Gregory Henriquez, whose firm headed up the Woodward’s redevelopment and is involved in other social housing projects in the city, quickly drew up a plan for 1,000 units to be built on eight sites owned by the city, but proposals that included using shipping containers as housing don’t appeal to Jang. 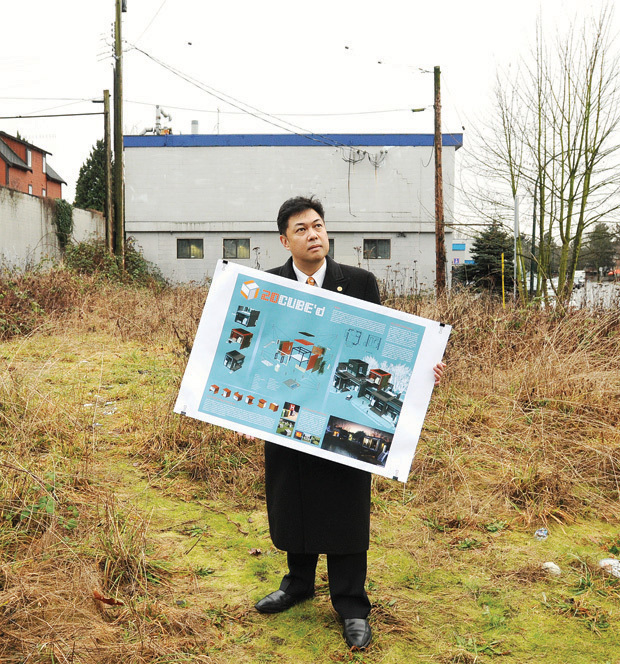 The city has a large land bank sitting idle, in the Downtown Eastside, Mount Pleasant and along Kingsway, and private property owners have also approached council, said Jang. The plan is to put temporary modular units on those sites and then move the units elsewhere if the city or developer wants to build on those properties at a later date, if and when land values rise. The city will pay for the cost of consultations and sewer and electrical connections, but if the units are built by the private sector, they’ll have to pay for themselves through rents. This raises the question whether modular units can be built cheaply enough so that rents are actually affordable to low-income earners. Also, if they are temporary structures, can they actually be moved elsewhere after five or 10 years of use and still retain their value? After all, city hall is asking private developers to take on the risk of building the units, leasing them, and then relocating them some day–and to somehow make a profit along the way. Rents under $1,000 a month will require that single units must cost less than $60,000 to build, including interior and exterior fitting. While there are local builders who might be able to provide wooden boxes for that amount, cheaply built units don’t travel well. “We’ve certainly had a lot of informal interest in the design community already. There are a lot of innovative designs being discussed,” said Jang. Many designers, architects and builders have already jumped into the fray. Among them is noted civic activist and developer Michael Geller, who has been vocal recently on the topic of new social housing developments. Geller’s interest in modular housing goes back decades. Standing in front of the Drake Hotel parking lot on Powell Street, which he suggests is an ideal location for a test project, Geller waxes enthusiastically about the potential for modular units. “I’ve been thinking about this for 30 years,” Geller said, adding that he raised the subject with fellow NPA member and failed mayoral candidate Peter Ladner before the 2008 election. 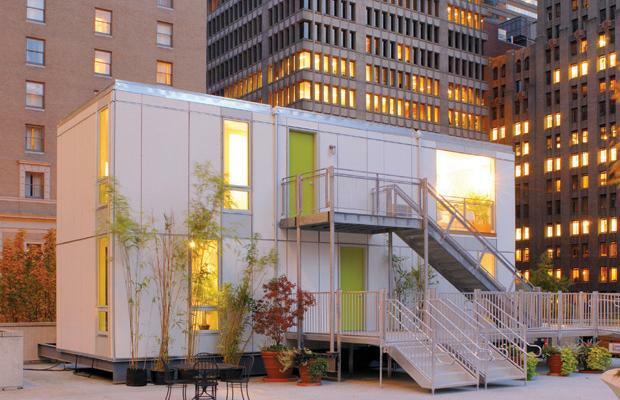 The NPA’s plan was to construct portable modular housing units on vacant lots across the city. The party talked with Langley-based modular homebuilder Britco about plans and cost estimates. Although he refuses to say that Vision Vancouver stole his ideas, the new modular housing suggestions by Jang sound very much like what Geller has had in mind for years. Geller said 450- to 600-square foot wooden modules, built of re-used pine beetle wood by local builders such as Britco Structures at their local factory, could be manufactured for about $150,000 and house up to four people. The portable housing units could be placed on any of the undeveloped vacant lots in the Downtown Eastside, or elsewhere in the city, on property that isn’t slated for development for a few years. “Think of this like community gardens, where developers are getting tax breaks for allowing their property to be used for some useful purpose instead of just sitting there vacant. It’s quite possible to make the units look very attractive by painting murals on the exterior or by landscaping,” he said, showing colourful designs of modular buildings that have already been constructed in other cities. At the International High Tech Industries factory in Delta, Dr. Rene Abi-Rached points toward workmen busy making modular units. His company stands poised to create a new form of modular housing, using automation and producing units in high volume. A tour of the IHI factory illustrates the magnitude inherent in this new technology. The 80,000-square-foot building itself was constructed using IHI’s mechanically interlocking concrete panels. The factory was erected in 2000 in only a few weeks using one crane and five workers. Abi-Rached said the same technology can be applied to single-family homes, townhouses, office towers and especially modular units for the city’s low-income earners. Abi-Rached said his company’s factory in Delta will be the first fully automated housing plant in the country when it opens this year. Production has been held up for several years because of a lawsuit with a major U.S.-based corporation that demanded global distribution rights. Instead of manufacturing thousands of modular units, Abi-Rached says his company has wasted millions in court, forcing him to use manual labour and motivating him to create a movement for legal reform (legal-reform.org) that would allow a small Canadian company like his to achieve equal footing with a global powerhouse. He expects his court case to be “finally resolved” in a few months and IHI will be using laser technology when the factory finally goes into production. Back at city hall, Coun. Jang said the outcome of the entire modular project will depend on two key factors–what innovative designs are submitted and what designs the public supports. Without success with both, the process won’t continue. Posted in Real Estate Related | Comments Off on Creative modular housing – hoist modules onto rooftops, float them on water – proposed for Vancouver. A national survey is forecasting rising Vancouver house prices into 2011 following a general rise late last year. “Trends in the housing market continue to be driven by the lingering after-effects of the recession,” said Phil Soper, president and chief executive of Royal LePage Real Estate Services. “Canadians realize that interest rates are unsustainably low and that homes will become effectively more expensive when mortgage rates return to normal levels. We will likely see more price appreciation early in 2011 as some buyers complete transactions in advance of anticipated higher borrowing costs.” Year-over-year, fourth-quarter 2010 house prices in Vancouver were up across the board according to the Royal LePage House Price Survey and Market Survey Forecast released this month. The biggest gain came from single-family homes on Vancouver’s West Side. Standard two-storey homes led the way, with average price gains across all neighbourhoods of 9.8 per cent over the same period last year, selling for a fourth quarter average of $1,007,500. Detached bungalows followed with year-over-year gains of 7.6 per cent, selling for a fourth quarter average of $891,500. Standard condominiums were close behind, selling for an average price of $484,500, a gain of 7 per cent. While single-family homes continued to dominate the market in terms of price gains, condos performed well across Metro Vancouver, particularly on the East Side. Eighty per cent of downtown Vancouver properties sold in the fourth quarter were condos. Vancouver buyers are being brought to the market by continued historically low interest rates and softening prices from the third quarter of 2010. Tight inventory and high prices in Vancouver’s West Side are pushing up prices in the East Side, particularly for houses. 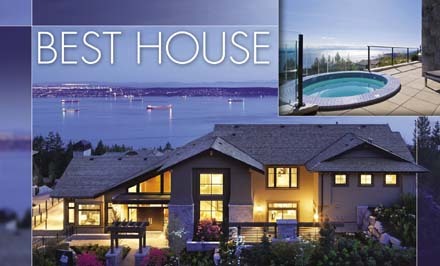 Vancouver house prices are forecast to increase 3.7 per cent in 2011, while inventory is expected to grow 8 per cent. Interest rates will continue to be the most important factor, followed by employment levels. Realtors add that one of the best times to buy is January, before competition picks up in spring. Nationally, the average price of a home increased between 3.9 and 4.6 per cent in the fourth quarter of 2010, compared to the previous year. Home values are forecast to continue a moderate and steady climb in many of the country’s key housing markets through 2011 with sales activity skewed to the first half of the year. Across Canada, the average price of a home is forecast to rise 3 per cent over the coming year to $348,600 while the number of transactions is expected to drop 2 per cent. TD Bank CEO Ed Clark, told a recent mortgage conference that the government should cut the maximum mortgage amortization from 35 years to 25 years. “We see a world in which low interest rates and excess liquidity has created asset bubbles all over the world,” Clark told reporters. Clark says Canadians have been following a policy of: “‘Don’t save. Take a longer period to spread out your payments. '” “I don’t think that’s good public policy,” Clark said. The idea of reducing amortizations has been floated before, most recently this year when it was speculated that the Finance Department might cut the maximum amortization to 25 years. The government last changed amortizations two years ago. At that time, they were cut back from 40-years to 35-years on high-ratio mortgages. However studies show that, in almost all cases, people who take 35-year amortizations plan to pay off their mortgage much quicker. In fact, the average Canadian gets rid of their mortgage in 1/2 to 2/3 of their original amortization, according to insurer sources. In other words, due to pre-payments, people pay off their 35-year mortgages in far less than 35 years. RBC Economics Research has released a report saying the proportion of pre-tax household income it takes to own a home declined in the third quarter of 2010 after a full year of deteriorating home-ownership affordability. Lower home prices and mortgage rates were the reasons for the recent improvement. “The improvement in affordability during the third quarter has relieved some of the stress that had been mounting in Canada’s housing market over the past year,” said Robert Hogue, senior economist for RBC. “After appreciating rapidly during the strong rebound in resale activity last year and early this year, national home prices recently came off the burner and retreated modestly as market conditions cooled considerably through the spring and summer.” RBC said it took 40.4% of household income, on average across the country, to own a bungalow between July and September. That was 2.4 percentage points lower than the second quarter. The cost for owning a standard two-storey home fell 2.5 points to 46.3% on income, and the affordability rate for condominiums was down 1.4 points to 27.8%. Looking at the percentage of household income needed to own bungalows in major markets across the country, it was 68.8% in Vancouver, 47.2% in Toronto, 41.7% in Montreal, 38.2% in Ottawa, 37.1% in Calgary and 32.7% in Edmonton. NEW CONDOMINIUMS: The demand for condominiums is linked to lower prices, but also reflects a growing number of people downsizing and living alone. 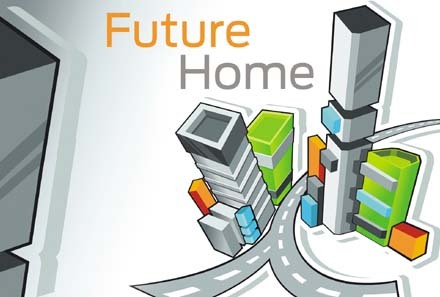 Judging by demographic trends, sales and construction activity, the future of housing is leaning sharply towards condominiums and townhomes. “Condominium apartments and townhomes now represent one in two residential sales in Metro Vancouver – their universal appeal attracting entry-level purchasers to affluent, experienced buyers,” notes a study released last month by Re/Max. The demand for condominiums is linked, of course, to lower prices, but it also reflects a growing number of people downsizing and living alone. Today, 9.9 per cent of Canadians live alone, including more than one million seniors. Single people also account for 27 per cent of the population. As the baby boomers age, 38 per cent of long-term marriages end in divorce, and those that stay married often downsize to a condominium from a house when they become empty nesters. Virtually all of Canada’s housing demand growth will come from this aged 25 to 34, reflecting the maturing of the baby echo generation. “These buyers, many of them singles or young professional couples, should support continuing moderate demand for condos, particularly in urban centres close to employment opportunities,” said a recent study by Scotiabank. There is also high demand for condominiums from both local and off-shore investors, according to local Realtors. TD Canada Trust and the Royal Bank of Canada have increased some of their fixed-term mortgage rates by as much as one-quarter of a percentage point, effective Wednesday. At both banks, five-year mortgages, one of the most popular among Canadian homeowners, will rise by 0.25 of a percentage point to 5.44 per cent. Rates on three- and four-year mortgages are also increasing by a quarter of a percentage point, while one-and two-year rates will go up by 0.15 of a percentage point. Rates for mortgages that have six, seven, and 10-year terms will be unchanged. While Canada‘s economy remains relatively strong and the Bank of Canada has been hiking interest rates, concerns over the U.S. recovery continue to simmer. You are currently browsing the Les Twarog Vancouver Real Estate and Condo Blog blog archives for January, 2011.